Interested in running a more sustainable seafood program? One of my favorite organizations (Chefs Collaborative) has teamed up with the Blue Ocean Institute and created a website designed to educate professional chefs & culinary students about how to operate a successful sustainable seafood operation. I am in the process of completing the course and I have passed this along to my crew at Tastings. Its great to be able to share this with my team and then talk about what we are all taking from this program. The date has been confirmed that our next James Beard Dinner will be Saturday March 6, 2010. Last year we sold out our venue so =buy your tickets early this year. Tickets can be purchased by calling the JBF directly at 212.627.1111. We are excited to be working with Jorgr Ordonez & Fine Estates From Spain. on our 3rd project together. We have teamed up for some amazing wine dinners this past year and we are all committed to making this the creme de la creme of all our projects thus far. The menu is just about finalized and will include center of the plate items from the North East Region combined with great Spanish ingredients....for me its back to my preferred style of cooking with strong Spanish influences. Matt & I are excited about this menu and the direction its going. I'm not a pastry chef, and lately I have been really trying to figure out how we can take our desserts to the next level. At Tastings we are not currently in a position to have a FT pastry chef, so we take it upon ourselves to develop, test and execute pastry projects for our menu. Believe me when I tell you that something about pastry and me don't mix.... I am a chef though, so the basics I have down, and we develop great desserts but are always playing it safe, but I really want to take it to the next level. Maybe I don't have to be so "safe" when it comes to desserts. But how? The dessert above was "on the fly" Matt & I were doing a tasting menu for Green Mountain Coffee and some of Bostons top food bloggers. The theme was coffee and every course had coffee in a different form, used in a different way or texture. I wanted to do something that was different, so I played on a classic dessert in Morocco where coffee is infused with cardamom and then that is used to infuse fruits. We had some dates and the result was extremely tasty...Matt was making a fluid gel, coffee of course, and the result was pretty cool. Instead of pureeing the gel to make the fluid gel, we left it as a firm gel. The look was pretty cool, texture needed some work but overall.....very good dessert. Why cant all our decisions on dessert come out like this. The winter menu is under development...I'm looking forward to sharing with you what we do for our dessert menu. In the mean time.....hopefully more "on the fly" ideas begin to shape our thought process in the pastry department. 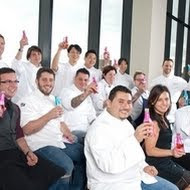 Last night was the awards ceremony and gala for the 2009 Boston rising star chefs awards....I am very honored to be included in this great group of chefs from some of Bostons best eating establishments. Made some great new friends and confirmed that chefs in our area just love what we do. After working in other cities and countries I am confident that Boston has the most committed group of chefs working TOGETHER to promote our passion for what we do.